And yet another award in 2018 for RavenPack, this time as a recognition on our Machine-Readable News. 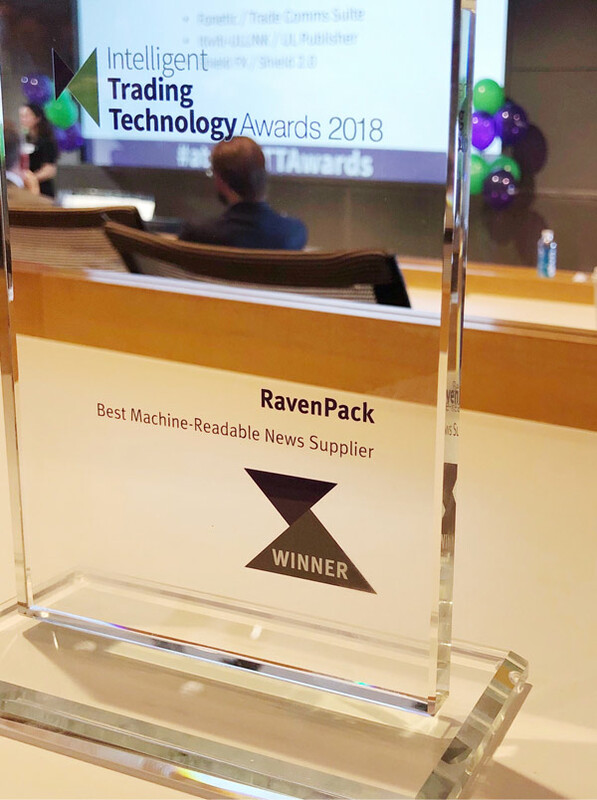 After winning the “Most Innovative New Product” award a few weeks ago for our Text Analytics platform, we won another award, this time for our flagship product called RavenPack News & Social Media Analytics in the “Best Machine-Readable News Supplier” category at the Intelligent Trading Technology Awards 2018. We are incredibly proud to win this award and for the acknowledgement of all our hard work and dedication in delivering the best products to our clients. Since our move to the cloud last year, our product team was able to enhance our off the shelf Machine-Readable News product. The cloud-based platform opens up access to unstructured data analytics which until now have only been available to the most sophisticated quantitative investors and traders. What is RavenPack Machine-Readable News? Our Machine-Readable News, known as “RavenPack News & Social Media Analytics”, was launched in 2003. It allows the users to query and visualize data on over a quarter of a million entities, including companies, commodities, currencies and products, with analytics on the roles that entities play in events, and the relevance, novelty and sentiment of the mentions. RavenPack Machine-Readable News is comprised of content from premium newswires such as Dow Jones, Benzinga, MT Newswires, Alliance News, FX Street, The Fly as well as multiple providers of regulatory news and press releases, and over 19,000 web publications. RavenPack Machine-Readable News allows clients to enhance returns, reduce risk and increase efficiency by systematically incorporating the effects of public information in their models and/or workflows. Most of the systematic investors will customize the cut of the granular data they need and access it through web APIs or simply download via csv or xlxs files. Discretionary investors can now benefit from Machine-Readable News thanks to RavenPack data visualization platform and receive alerts in real-time, when for example a sudden sentiment reversal or unusual media buzz occurs. Do You Want to Know More About RavenPack Machine-Readable News? For more information on our Machine-Readable News, please send your enquiry to info@ravenpack.com. 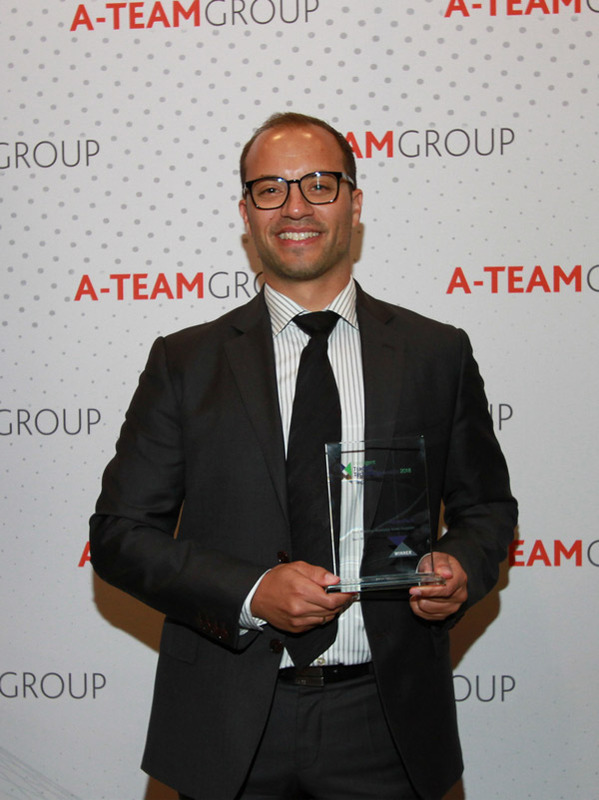 Peter Hafez, Our Chief Data Scientist attended the Intelligent Trading Technology Summit and received the award on behalf of RavenPack.